With the 2016 MLB season around the corner, we thought it would be fun to build our own Mount Rushmore of baseball autographs. In a continuing series, we allow the viewers to help construct this mountainside of signatures. Our first three selections are Babe Ruth, Mickey Mantle and Shoeless Joe Jackson. Who should take the #4 slot? In the following article, PSA’s Joe Orlando breaks down his selections and asks other hobbyists to consider their own. Brian Bancroft has been a longtime Philadelphia Phillies fan and baseball card collector. Through the years, Bancroft was looking for a challenge that suited his taste and he finally found one. The 2012 Topps Heritage set is one that may scare the average collector. The Master Set requires well over 2,000 different cards, from modern-era stars to vintage icons to autographed cards. In the next article, we talk to Brian and find out how his attraction to the hobby – and this monstrous set – all began. In the world of baseball tickets, it’s hard to envision a franchise with a more diverse selection of historical moments than the New York Yankees. Their abundance of championships and iconic figures makes collecting tickets of the "Bronx Bombers" a lot of fun. In the following article, a longtime hobbyist takes a look at a specific period in Yankee history: 1933-1947. It was during this time that undated tickets were produced, but our author’s goal is to unlock the mystery behind these relics. With the announcement that this will be Kobe Bryant’s last year as an active player, it seems fitting to highlight some of the sport’s finest guards to have ever graced the court. From Bob Cousy, Oscar Robertson, and Walt Frazier to Magic Johnson, Michael Jordan and Kobe Bryant, this 28-card composite has them all. Although missing one card, this collector’s set is littered with Top Pop cards and is the highest graded set ever to be registered on the PSA Set Registry. With a weighted GPA of 9.50, even sets that are complete are not near achieving the GPA of this set. Click here to view this set. PSA CardFacts is the foremost online encyclopedia which provides collectors with expert narratives, articles, pricing, populations, and auction records for trading cards. The PSA Set Registry has incorporated PSA CardFacts into "My Set Registry" so you can now view all the details about your card right from your private inventory. Everything you find in CardFacts is there as well as any additional information you may have added about your particular card. Just login to the PSA Set Registry, go to "My Inventory" and click the link to "My CardFacts" in the "View" column next to the card you want to research. From the "My CardFacts" page you can upload/delete images, add/edit your own comments, add/edit your purchase date, source, cost, etc. It’s a complete picture of all the facts about your card, both specific and general. Auction closes next week. 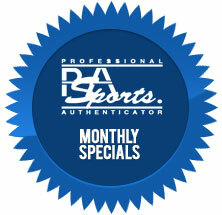 This auction will offer affordable sports autographs and memorabilia. Nearly all items have a retail value of $500 or less and carry very low minimum bids. Greg Bussineau Sports Rarities’ "Spring 2016 Vintage Trading Cards Auction" is now open for bidding. The auction features 971 lots of important rarities, highest graded examples, legendary Hall-of-Famer cards, and complete sets. Bidding will end on Thursday, April 7th. There are 751 lots for Auction that will end on Thursday, March 31st. This Auction features many high-grade and low pop cards for Collectors to complete their sets from the 1950s to 1970s. Rich Altman’s Boston Show, April 15-17, 2016. New Guests Added! Rich Altman’s Boston Show is returning for a seventh year to the Shriner’s Auditorium at 99 Fordham Road, Wilmington, MA on April 15-17, 2016. Like most athletes who played parts of their careers in the Empire State, Joe Morrison of the New York Football Giants earned his share of nicknames: Old Dependable, they called him, Mr. Versatility, Captain, Most Valuable Player, Mr. Wonderful even. After his playing career, he earned yet another name when he surprised the nation and coached the USC Gamecocks to the Gator Bowl, earning himself honors as the Walter Camp National College Football Coach of the Year. "The Man in Black," they dubbed him in Columbia. And USC’s unforgettable season: "Black Magic." One of a small number of 1916 Babe Ruth rookie cards with Weil Baking Company advertising on the back topped the sales list in Memory Lane Inc.’s recently completed I Own It Now catalog. One of the rarest variations of the familiar Ruth card issued through numerous sponsors 100 years ago, the EX graded example sold within minutes of the sale’s opening last week for a price of $136,850 including a 15% buyer’s premium added to all purchases. Last fall, the same card had sold elsewhere at auction for just over $87,000. 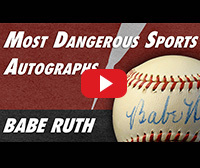 Which one of the following baseball autographs do you think has the most eye appeal?